Its easier to make two devices talk to each other if they are in the same network. An ethernet cable can easily make your laptop’s network available to the Pi. But we don’t have one. So we are going to add a file to the SD card so that the Pi boots with a wifi pre-configured. The SD card mounts as two volumes boot and rootfs . Open the boot volume and create a file named wpa_supplicant.conf On booting the RPi, this file will be copied to /etc/wpa_supplicant directory in /rootfs partition. The copied file tells the Pi the WiFi setup information. This would overwrite any existing wifi configuration, so if you had already configured wifi on the pi, then that will be overwritten. 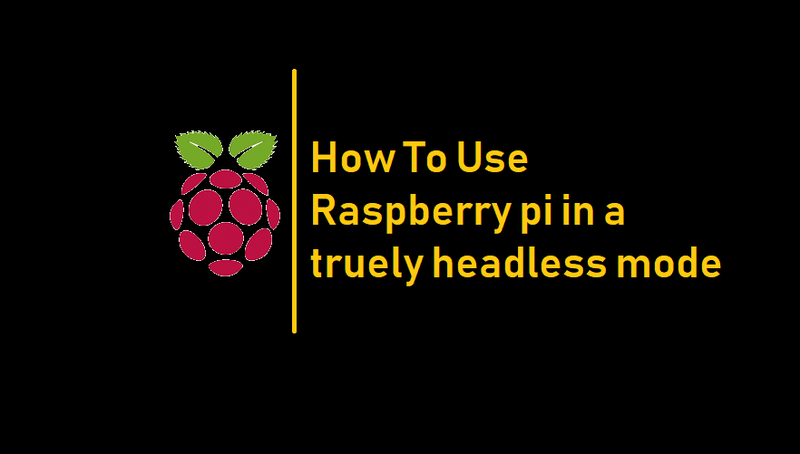 We will later access the Pi using a secured shell (SSH), SSH is disabled by default in raspbian. To enable SSH, create a file named ssh in the boot partition. If you are on linux, use the touch command to do that. Before switching on your raspberry pi, we need to findout the existing devices connected to the network. Make sure your laptop is connected to the same wifi network as the one you configured on pi above. Host is up (0.000097s latency). Host is up (0.040s latency). so 192.168.1.2 should be the ip address of the pi. To connect to Pi you need the default username and password of the device. On first boot, the username and password would be as follows. Type in y when asked if you sure to continue connecting with the device. Then when asked for password, type in the pass. Its a good practice to change the password to something else. You can use the passwd command to do that. Sometimes it doesn’t feel right if we can’t use the mouse. For that we need to look into the Raspbian desktop. We need to setup VNC (Virtual Network Connection) to see and control Pi graphically. Let’s do that. These commands would update Pi’s softwares and install realvnc which will be used to setup remote sessions. If you are on debian/ubuntu, you might have to do some additional step after downloading the executable. Here we are changing the file mode of the downloaded executable to make it installable. We are also moving the executable from the downloads folder to the home folder. Once RealVNC viewer is installed, add the raspberry pi device to the connections (File > New connection). Enter the pi’s desktop identifier (192.168.1.2:1 ), give it a friendly name, click Ok. Enter pi’s username and password when prompted. That’s it, you should now see the desktop. Give me a five! Team Viewer has released a version for Arm based devices and we are gonna use that. You can rm the teamviewer deb file after installation. Now now, how do I setup a remote session with this? After installing we should have a teamviewer cli tool installed on the pi. Lets check if the teamviewer daemon is running. Should return a lot of text in which you will find “active (running)” in it. Open (or install) team viewer in your laptop. Sign In. You should see the Raspberry Pi device listed under “your computers”. Simply double click and start controlling it over the internet. Pingback:Remote control your Raspberry Pi from your PC with VNC!